If you're a DIY enthusiast, you may be familiar with the wide-range of special finishes that can turn a plain table or dresser into a conversation piece. 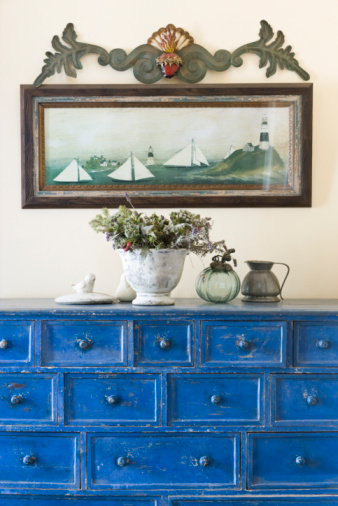 Subtle webbed cracks in a painted or stained furniture piece create an antique look that stands out in a modern home. This look can be mimicked with a crackle finish. To get a crackle finish, you will need to think backwards. The color peeking through the cracks in the finish is the base coat. You can either leave the surface its existing color, or pick something new as your base. If you are happy with the shade of wood stain or paint, you can crackle the surface as-is. Once you have decided on your wood stain or paint base coat, apply the crackle finish directly on the surface. If you are changing the look with a new base color, treat your furniture to a new coat and wait until it is completely dry before applying crackle finish. Crackle paint or finish can be found in most paint or home improvement stores. Depending on the brand, you can find an array of colors in spray or standard cans. There are pros to both. Spray paint allows for a faster application and drying time. Paint that is brushed on allows you to apply a thicker finish in some places, creating a more authentic antique look. Before applying any stain, paint or crackle finish, clean all surfaces of debris and dust. Remove hardware pieces such as knobs, handles or hinges. Remove drawers and doors as well and set them aside to paint separately. Like with all paint projects, make sure you are in a well-ventilated area and have a drop cloth or protective material under your furniture to catch any spills or drops. Spray or brush your crackle paint over the surface of your piece. Spray evenly across the surface, following safe distance instructions on the can. Some paint manufacturers recommend waiting five minutes for the paint to begin to dry before applying a second spray coat that will increase the cracks. When using a paintbrush, use even strokes running side to side. A thin coat will result in small, hairline cracks that show the base coat or original paint underneath. A thicker coat of crackle creates larger cracks. Alternating thin and thick coats or choosing random spots for thicker coats creates a unique look. Let the crackle dry for as long as recommended on your paint manufacturer's packaging. If there is no suggested drying time, wait at least 24 hours to be certain the paint is dry. Adding a clear topcoat of acrylic polyurethane will ensure your work will last longer and withstand wear and tear. For extra spider-web crackles and a more mottled finish, use a spray paint latex top coat. Both topcoats are available at paint and home improvement stores. To further the look and depth of the cracks, an acrylic topcoat in the same color or a contrasting or complementing color can be applied before or instead of a clear coat. While the base coat and crackle coat will already create a two-toned look, adding another layer can strengthen or deepen the shade. Using the same color as your crackle paint will create a darker finish. Apply this topcoat with a brush, first creating a test patch in an inconspicuous place to ensure the color that dries on the furniture is the color you desire. Furniture with a lacquered or clear topcoat can still take an application of crackle paint for an antique look with a bit of elbow grease. Taking a sheet of sandpaper to the surface before beginning the crackle process can make the lacquer porous enough to apply crackle paint. Rub sandpaper over the entire piece of furniture, paying attention to the areas that will get the most use. Apply a base coat after sanding, then your crackle finish when the base coat is dry.